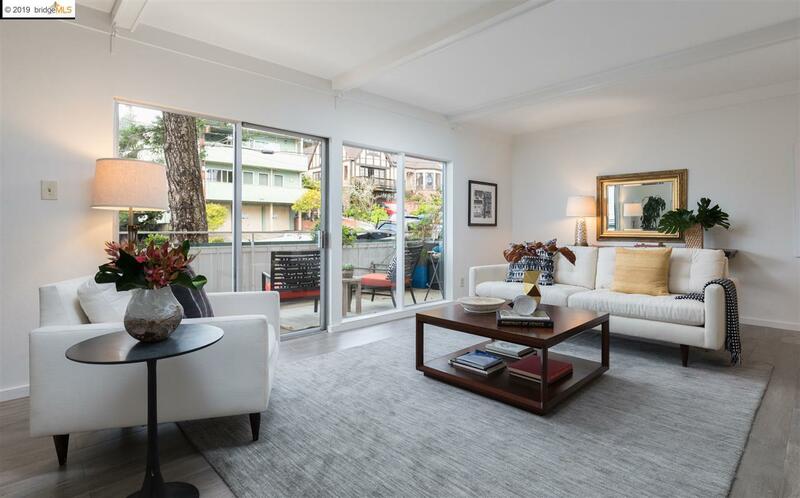 Set in a complex with an exotic courtyard garden complete with fountain and towering Bird of Paradise, this recently updated unit offers a tranquil retreat, yet is so near all the pleasures of North Berkeley. The UC Campus and the GTU are just blocks away, and the Gourmet Ghetto, downtown Berkeley, Tilden & SF are easily reached. This exceptionally spacious 1 bedroom unit has just had a significant transformation! You'll find hardwood floors & all new lighting throughout, newly installed quartz kitchen counters, sink & faucet. There is a new forced air furnace with a Nest controller, & the entire unit has been freshly painted. At 872 sq. ft., this corner unit is tremendously spacious! With both a pantry & large hallway closet, the in-unit storage is impressive. The open floor plan in this corner unit provides an abundance of light. The expansive front balcony provides an additional outdoor garden room for enjoying container plants, views of Mt. Tamalpais, and watching gorgeous sunsets!